Unlike other companies we hand-pick and photograph all our cowhides individually so the cowhide you see here is the one you will receive. Since cowhide is a natural product, each and every cowhide is totally unique to you. Buy online now or call us on 020 7099 6616 to book an appointment to visit our showroom in Fulham, London where you can choose from over 1000 cowhides in stock. This stunning extra-large. speckled cowhide rug has been hand-selected from one of our quality assured tanneries in Columbia. Cowhide rugs are virtually indestructible and can weather the toughest pet and food stains, making them the ideal choice for even the busiest of households. 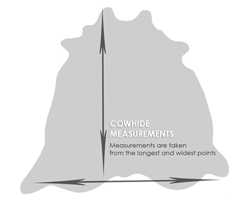 Please note we offer the measurements as an approximate guide only, and each measurement is taken from the longest and widest points of the hide. Order before 12pm for a next day 'before 12pm' delivery slot.